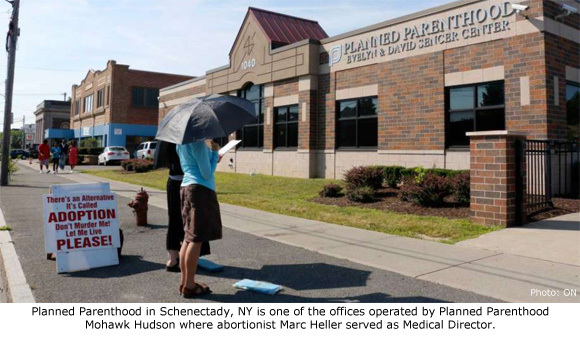 Cooperstown, NY – As Planned Parenthood Mohawk Hudson relocates into their new $2 million office in Queensbury, New York, today, an interview of their former Medical Director sheds light on Planned Parenthood practices that place the lives of women at risk. 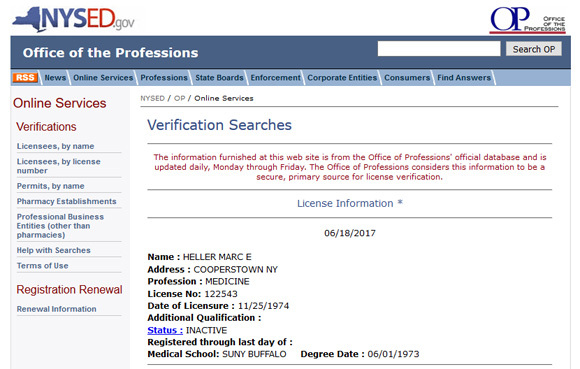 Marc Elliot Heller worked until very recently as Medical Director for Planned Parenthood Mohawk Hudson, Inc. at abortion facilities in Utica and Schenectady, New York. On November 19, 2016, a student from the Cooperstown Graduate Program, State University of New York-College at Oneonta interviewed Heller about his work conducting abortions. During that interview, Heller discussed abortion complications that required emergency hospitalization. While he (unconvincingly) downplayed the number of times his staff would have to call an ambulance for an abortion patient, he admitted that he ordered his staff to request that ambulances run silently and go to the back door in order to avoid bad publicity. Even if people didn’t like abortion, they would take care of my patient’s medical problems. There [at Planned Parenthood], it was always like you never knew. The transfers were very rare, but we always said to the ambulance, “Please come to the back entrance. Please don’t use any sirens or lights,” because we knew that the protestors that were there every day would call the press. And there would be a press thing about “another botched abortion.” So we went quietly out and then I drove along and sat there until either they were admitted to the hospital, which only happened a couple times, or they were discharged. I tried to be quiet and nice to people. Sometimes they were nice and sometimes they weren’t, but I was an outsider and I think being an outsider was characteristic of all doctors who performed abortions across this entire country. You lose your colleagues. Heller discussed an incident where one of his patients nearly died. Heller also revealed that when he was trying to establish his own abortion clinic within a hospital setting prior to his employment with Planned Parenthood, he rewrote the bylaws in order to avoid having to submit aborted baby remains to a pathologist for examination, which could confirm whether or not an abortion was complete. Heller explained in the interview that he did it to save money. 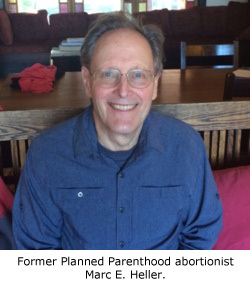 Heller described his feelings of isolation and ostracism as he moved from a hospital environment to Planned Parenthood’s outpatient abortion facilities. When I decided to leave the hospital and be medical director, I became professionally completely isolated. There was no other doctor around when I worked mainly in Utica and Schenectady. There were virtually no sympathetic doctors in Utica and there was one in Schenectady, but I didn’t see them. At the hospital here there was a whole cadre of specialists and sub-specialists so that if there were medical problems I could turn to them. I could see my colleagues every day. One never knew at the clinic how one would be received when one called the patient’s primary doctor or specialist if they had a medical problem. So it was always sort of like a deep breath; give them a call. Some were fine. Some weren’t that nice at all. It was two months before my daughter was born. I had had all kinds of treatment. I had had individual psychotherapy, group psychotherapy, marital therapy and some psychoanalysis because I had a lot of emotional problems, which is why we didn’t have kids for such a long time. But two months before my daughter was born I really realized that I didn’t want to be a parent and drink. I don’t know. It was a gift. It was not so much difficult not to drink, but difficult in overcoming the shame of being a doctor that drank. It wasn’t complicated. I just didn’t drink and I went to AA [Alcoholics Anonymous] for twelve years. I just made that decision. I guess that’s the story of that. It wasn’t that complicated really. What it did for me was, besides it was a difficult thing, it also helped me to join the human race in a way that I never could have before. Ironically, Heller credits his pre-born daughter for giving him the strength to stop drinking. I didn’t drink at work. I drank at night to be able to sleep, because I think it was a treatment for my depression and not a good one, but it was what I used to sort of manage it. I used to get panic and anxiety attacks. [Laughter] When patients came with those, there were colleagues who said, “Oh they’re just crazy.” I was always very comfortable with the crazy patients, because I had known horrible that feeling is; afraid you’re gonna live, afraid you’re gonna die. It’s hard to say. I think I was less crabby. I rarely drank large quantities, but I drank enough pretty much every night to sleep, but it still makes you crabby the next day. . . I was lucky. I was really lucky. It was because of my daughter. She’s the one; I think her spirit came to me before she was born somehow and gave me that gift. Heller claims to have done over 14,000 abortions during his career. It is hard not to wonder what “gifts” those 14,000 human beings might have been to their family and communities, had it not been Marc Heller.